This is a unique restaurant frequented by locals and tourists since 1978 for particularly two things: beer and ham. Plain and simple. The space almost has a 'retail' and 'deli' feel to it with fresh cheeses and charcuterie with lovely shades of orange, red and brown on display as well as a wide variety of smoked hams suspended from the ceiling. Expect the finest quality of cured meat here. Its popularity has rendered it a spot on a must-visit attraction in Lonely Planet and TripAdvisor. 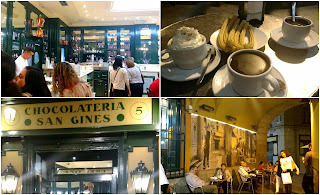 Talking about iconic cafes, Chocolateria San Gines tops the list. If there's anywhere you want to try classic Spanish churros, it's here. Thick gooey hot chocolate makes the perfect dunking partner for long crispy churros. I even loved the Viennese coffee (it's the cup in the picture topped with cream). Located in a narrow alleyway, this 1894 cafe (originally an inn and lodge) transports you back to the old sepia times. As we enjoyed cupping our hot chocolate by a table outside in the chill evening weather, we were warned by the servers not to keep our wallet or phone on the tables as passersby may steal it in the blink of an eye. Above is a glimpse of what the world's oldest restaurant looks like Sobrino de Botin, one of Earnest hemingway's favourites. They hold the Guinness World Record for the title. An inscription above the main door recalls the date - 1725. The building has been witness to three centuries of Spain's capital Madrid. Famed for its Castilian cooking, the specialty to try here is roast suckling pig, roasted in the original 300 year old cast iron ovens. At the entrance they also have Iberico ham that can be cut to order. Outside the restaurant is a display showcasing miniature model pieces recreating the restaurant interiors as was in the 1700s. Spain has a beverage to offer for both teetotalers and tipple-lovers. 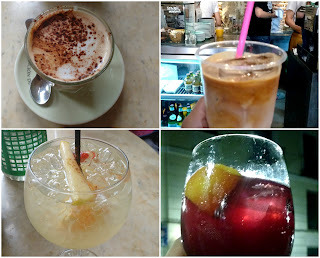 The iced latte (top right) from Pum Pum Cafe (cute name right?) was sweet, milky and cooling, the best companion on my walk to Las Ramblas, a verdant street lined with stalls selling everything from trinkets to tees. On the top right you have the Cafe con Leche, a Spanish hot coffee, it's what Spaniards start their day sipping on. The you have Sangria, Spain's most loved drinkable export to the world. Seeped with juices from fresh citrus, every sip of red wine sangria was thirst-quenching at the end of my long day of exploring! Another local drink is Cava, a sparkling wine made from local grape varieties. Try the Cava sangria (bottom left)! If I had a penny for every time I heard this - food markets are the best place to get a feel of the locals and the culture - I'd be rich. Well, but it is true. Mercado de San Miguel in the heart of Madrid is a buzzing center for culinary discovery. 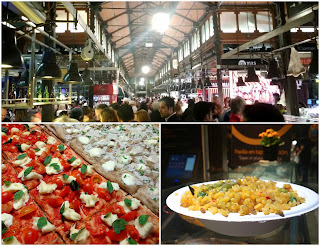 Walk around this newly restored market building and explore tapas, seafood, wine, beer, pizzas, chocolate, candy and more! I had a bowl of vegetarian Spanish paella and to describe it perfectly, it was comfort in a bowl that set me back by just 4.20 euros. 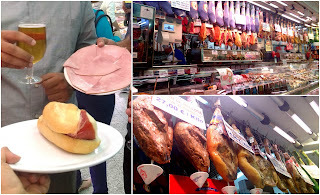 Try small portions so you can hop around the different kiosks in the market and sample a variety of delicacies. They say, you can't leave Valencia without eating at La Pepica. The 120 year old interiors of this culinary landmark is adorned with photo frames capturing visits to the restaurant by dignitaries and celebrities from Spain and beyond. Celebrating Valencian cuisine, dishes here are a reflection of the ancestral recipes. Taste history by ordering La Pepica's Paella, a dish originated in its kitchen exclusively for great Valencian painter Joaquin Sorolla who preferred his paella with pre-peeled seafood and prawns. 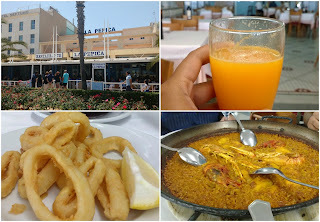 Skip the sangria and drown your paella with fresh juice of Valencian oranges. Tapas...a fancy word to encompass an assortment of hot or cold appetizers. And chefs in Spain have elevated tapas entitling it to have its own cuisine form. 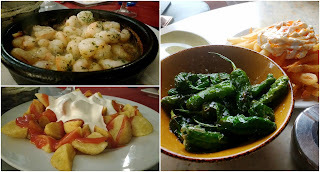 You mustn't miss the Spanish style pimientos de padron (fried green peppers dusted in salt) and patatas bravas (fried potatoes topped with spicy tomato aoili). Still intimidated by the word 'tapas'? Just get onto a Tapas Tour with Secret Tours Barcelona and they'll unravel the world of this native Spanish cuisine to you. That brings me to the end of this post. I hope it has you salivating and planning your the trip to Spain you've always found an excuse to put off. Eat, travel and buen provecho!